Wouldn’t it be nice to be able to relax at work, or at least sit comfortably behind your desk? While office chairs are progressing to the point of being able to offer you comfort and support when you are seated for a long period of time, it will still never be the same as your recliner. Now that recliners are featuring new, more modern designs, that are slimmer and sleeker, they are able to fit in the increasingly common smaller living spaces. This also means that these recliners can often accommodate most executive desks or fit into office corners so you can have the same comfort at work that you have at home. If the recliner happens to include an ottoman and massaging capabilities it is just another reason to replace your out of date furniture. 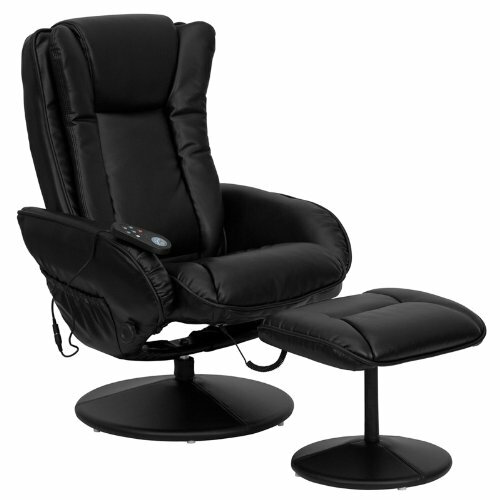 Perfect for game rooms, home or business offices, and almost any other room in your house, this Massaging Black Leather Recliner has everything you need to stay comfortably seated for hours. The massaging function helps to relax sore, tired muscles all the way down to your toes, and its sleek all black design is both modern and elegant. Great as an office chair or a new favorite recliner, you’ll also love its sturdy construction that is easy to maintain. 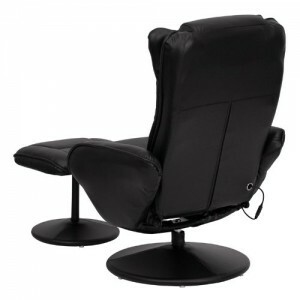 This massaging black leather recliner is designed to give you optimal comfort and style. The sleek recliner and ottoman are upholstered in durable black leather that feels just as great as it looks. The base of both the chair and footstool are also covered with the matching leather for a uniform appearance that never goes out of style. The back and seat of the massaging recliner are padded for comfort and support, along with the cushioned ottoman that can also be used as an additional massaging seat. Recline fully back for a powernap or prop your legs up during an extended conference call, this reclining chair game even keep professional gamers comfy during an extended day of play. Not only does this black leather massaging recliner cushion and support your legs and back, it can also rub away aches and pains. There are five settings that are already programmed into the chair, so you can easily find the best one to massage your thighs, back and lower legs. The controls are conveniently located on the arm of the recliner, and it will also power the massaging unit in the ottoman. Since you can control the massage’s intensity, it is easy to find the perfect setting for you. The leather massaging recliner is lightweight at 54 pounds, making it easy for you to move it around your home or office. Both the ottoman and chair can be assembled in minutes, and the durable leather material is easy to maintain and clean. Cracks and crevices can be quickly vacuumed or wiped clean, and the upholstery is resistant to stains and cracking. Professional looking and incredibly comfortable, you won’t mind sitting all day in this reclining leather massaging chair. Vibrating massager in the chair and ottoman. The lightweight leather massaging recliner weighs 54 pounds and measures 29.2″ x 46″ X 42″. 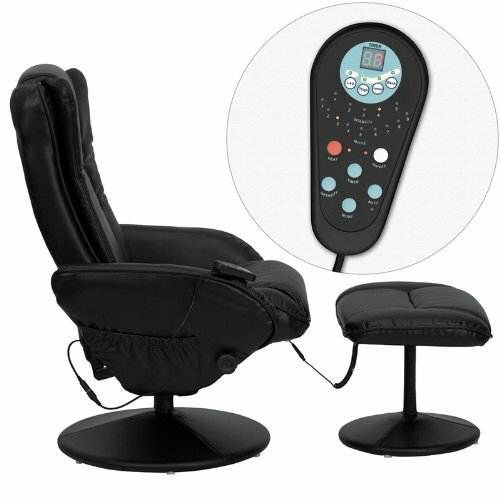 5 preprogrammed massaging settings for both the chair and ottoman, making it easy for you to find one with the right level of intensity. A side pocket is located on the right of the chair, so you can always find the remote or your current reading material. Back and seat are double padded to give you exceptional comfort and support. 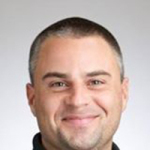 Next Article Are Squeaks and Creaks Keeping Your From Enjoying Your Rocker Recliner?